Ok! so my career as a stand-up comic is still never going to happen developing but yesterday I was inspired to write about my support network after reading the lovely Jacqueline’s post ‘Calling all Dreamers’. She hit on something that has underpinned my entire academic career – that of support. 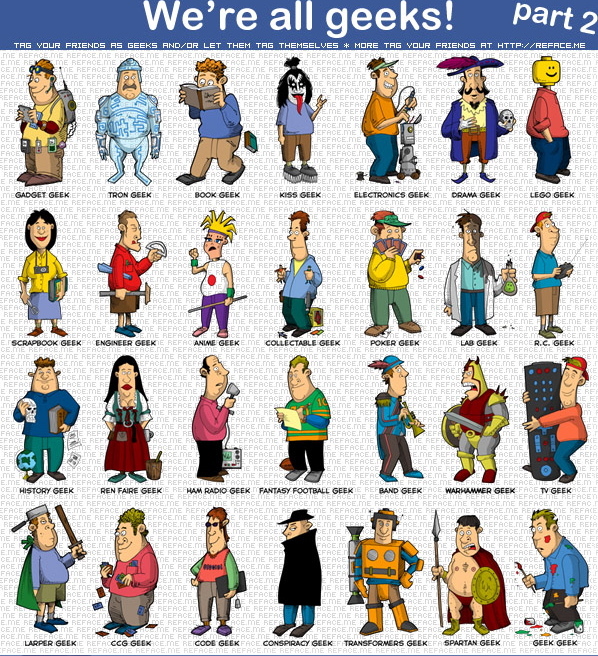 I have been the beneficiary of so much support, from my family from my friends and most importantly (in some respects) my fellow Geeks – the number of which totals two. These two people provide me with a very important outlet – the space to talk shite! about what I love to talk about most – literature, politics, gender dynamics, feminism, history. I know I can drop the odd quote into the conversation without sounding like an utter freak. I can spout forth about Nietzsche and there isn’t a single eyebrow raised or a glazed over eye. It is so important to have a context like this in which you can feel, well how shall I put this, normal. most importantly ~ They GET my jokes! advice. When I am feeling insecure about my work I can get one of them to give it a quick glance over and say ‘aye that’s ok’ (he’s a bloke and very succinct in these matters). But most of all I can relax, laugh and be so utterly geeky in their company and not be embarrassed. I don’t have to justify what I do (which even with very supportive family can be a bit of a bone of contention). The same things rock our boats. Sharing discoveries about our research is met with shared euphoria and you don’t feel as though they are doing it just for your benefit. The Thesis Whisperer blog today issued a post about collaborative work and this kind of fits in with what I wanted to say as well. Because, it may be a cliche, but a problem shared really is a problem halved. Working in isolation, as we inevitably have to, we need these points of contact with fellow like-minded people to sustain our energy and enthusiasm. It also kind of plays into my posts about Conferences, Forums and Symposia acting as a sort of ‘living well’ of community and inspiration. It is important to sustain contacts and relationships of this mutually supportive and understanding nature. What follows is an example of the consequences of eschewing this kind of mental support – albeit an extreme one and one taken from the early part of the Twentieth-century, but , still in my opinion, one worth re-telling. ***GEEK ALERT*** What follows is also related to my Phd and may provide the cure for insomnia should you choose to read on! To any one interested in Suffrage and Women’s Rights it may be of vague interest. As human beings were are designed to live in a community (even if it doesn’t feel much like it a lot of the time). Mentally it is proven that bouncing ideas around ‘brain storming’ and taking part in collaborative work can have enormous benefits to our own personal intellectual development. This already acknowledged fact was given further credence recently as I read my god help me if I lose it, damage it, am late returning it British Library Book ‘A Brave and Beautiful Spirit’: Dora Marsden 1882-1960. Marsden was an intelligent and remarkable woman, who began her intellectual life at 13 when she became a Teacher-Apprentice. She worked as a teacher and attended, via scholarship, Owen’s College at Manchester University receiving a BA. Manchester was one of the first colleges to accept women and confer them with degrees.During her time at University she became interested in the hot topic of the day Suffrage becoming friendly with many women who would later become synonymous with the Woman Movement of the early Twentieth-century. In 1908 she became active in the WSPU whilst still a teacher ~ there is a strong affiliation between women teachers and the suffrage movement which began life with Mary Wollstonecraft’s assertion that women should be educated back in the 18th century. She quickly rose to prominence and carried out some incredible stunts to draw attention to the movement and the rights of women to secure the vote. Not least was The Winston Churchill Affair, which has become legendary in suffrage history briefly recounted here from Spartacus. Dora Marsden provided an account of what happened next in Votes for Women: “A dirty hand was was thrust over my mouth, and a struggle began. Finally I was dropped over a ledge, pushed through the broken window, and we began to roll down the steep sloping roof side. Two stewards, crawling up from the other side, shouted out to the two men who had hold of me.” Despite being arrested the local magistrate dismissed all charges against them. Disaffected with WSPU autocracy, she and fellow members Grace Jardine and Mary Gawthorpe left and began a small periodical called The Freewoman: A Feminist Review in November 1911. It was a notorious and controversial publication which eventually was banned from distribution by W.H. Smith and in it Dora Marsden was to pursue her continued interest in Philosophical academics. Her life is one of tragedy. So brilliant a star was dimmed by a series of events which led to her moving from the hub of literary life, London, to a small place called (ironically) Seldom Seen, near Ullswater, ostensibly to get the peace and quiet she required to ‘think clearly and work industriously’ … it was the beginning of a very slow and sad decline, which Les Garner believes culminated with an attempted suicide in 1935. She spent the last 25 years of her life in an asylum for the mentally ill in Dumfries, still continuing ‘her work’. Like many great thinkers (Descartes for example) she believed that isolation was the key to clear and lucid understanding, when in fact what she most likely needed was the discursive community she had striven to create within the pages of The Freewoman/ The New Freewoman. Once she withdrew from this ‘living debate’ her mind lost its ability to relate philosophy to reality and as a consequence it drifted towards insanity instead of brilliance. So sad, so tragic and (albeit a rather extreme) a salutary lesson to anyone who thinks they can’ go it alone’ . I agree completely with the first part of your post. One of my anxieties about doing a PhD is the isolation. I found the distance from uni while doing my MA an issue and it is one of the reasons I have applied to a much nearer Uni for the PhD. I envy you your contact/friendship with people you can discuss your topic with, without feeling like you are boring them, or showing off your academic/geekiness. I really notice the difference when I am chatting to people I meet at conferences and seminars – they get it. I don’t feel awkward getting entusiastic about my topic. If I do get to do my PhD, the camaraderie/community is something I am looking forward to. 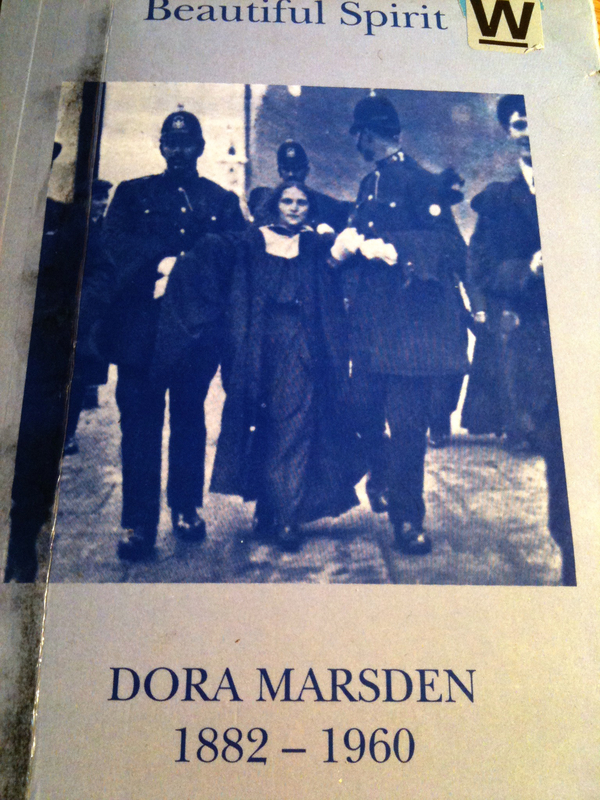 Dora Marsden’s tale is scary – time and space to think is vital, but only for short periods. I know I for one could not cope with complete solitude. I love seminars/contact with peers and believe I learn a great deal from the mutual sharing of ideas.